Living in seclusion, away from everyone, a man is desperate to be a part of the community and share in the holiday joy. 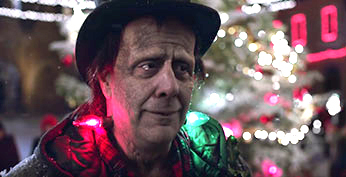 Apple’s 2016 holiday commercial, titled ‘Frankie’s Holiday’, depicts Frankenstein as he seeks to find acceptance. Heading into town, Frankenstein is met with looks of shock and horror. He heads under a large Christmas tree with festive lights draped around his neck and begins singing the tune “There’s No Place Like Home for the Holidays.” Embarrassment creeps in as one of the bulbs dangling around his neck goes out. A little girl from the crowd reaches to fix the bulb. She then leads the surrounding villagers to join in with the carol. Frankenstein finally feels accepted and like he’s a part of the community. Apple admirably makes this heart-warming message the focus of the commercial and only subtly shows Apple products throughout. This message of acceptance is an important reminder to take with us, especially when our society is constantly placing the emphasis on differences. Rather than be separated by our differences we must all come together as a community, spreading love and acceptance.